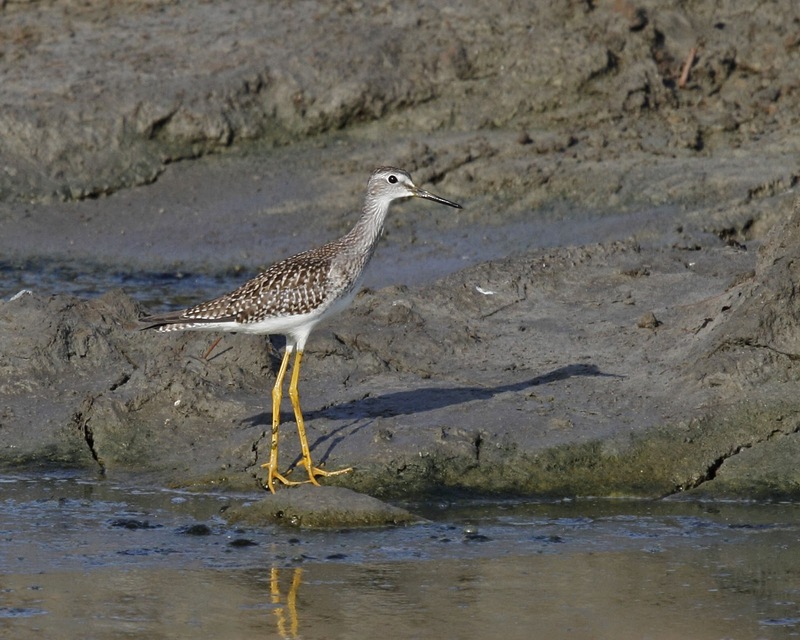 Late July and early August might not seem like "Fall" to anyone else except us crazy birders. 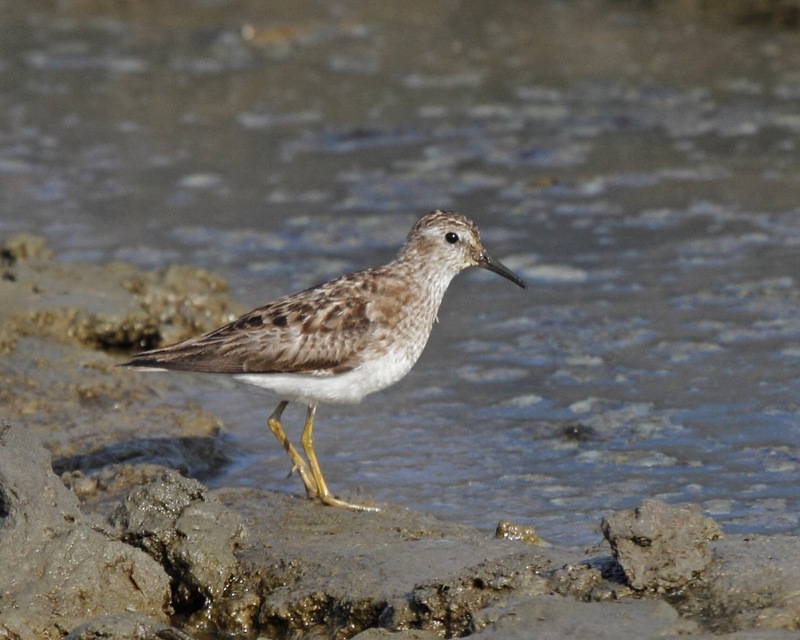 We know that Fall Migration starts in July when the shorebirds start heading south after a brief nesting season in the arctic. They leave their babies to fend for themselves and high-tail it south in July. By August, the number of shorebirds in NJ and DE starts to build up. Don't get me wrong, they keep coming until late October but the crazy people start looking for them in July. By early August, a handful of warblers start to make their way south too. 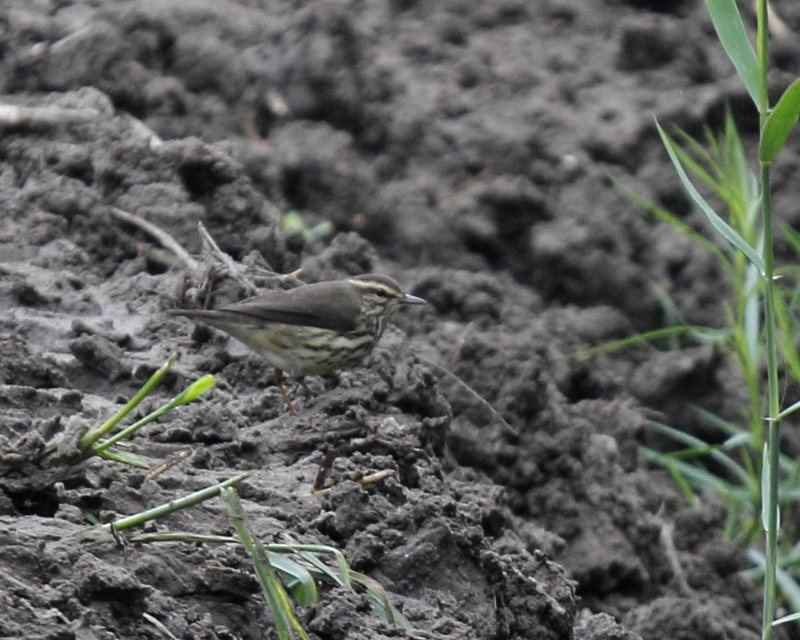 I spent the birding part of my weekend with my birding buddy Harvey looking for these early migrants. Harvey is an expert birder and also an expert about where to find them at Forsythe. He knew right where to look for each species. I added 2 birds to the list for the Stupid Contest at Forsythe - Stilt Sandpiper and White-rumped Sandpiper. 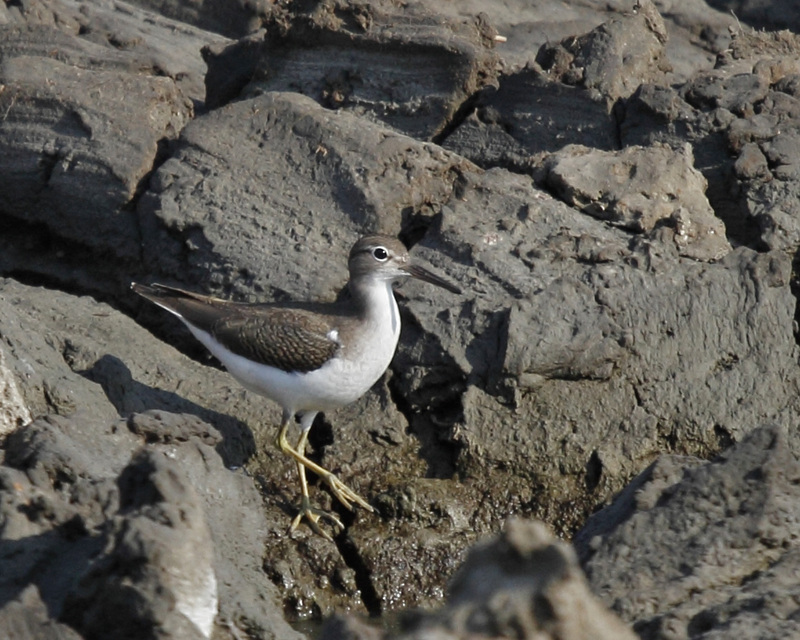 We only heard the White-rumps but the Stilts put on a great show as evidenced by this photo. They even have reddish patches on their face which is leftover breeding plumage. I know that they don't look like much to the average person, but they are pretty cool shorebirds - and a sight for sore eyes to me since I missed them in Spring migration for the Stupid Contest. 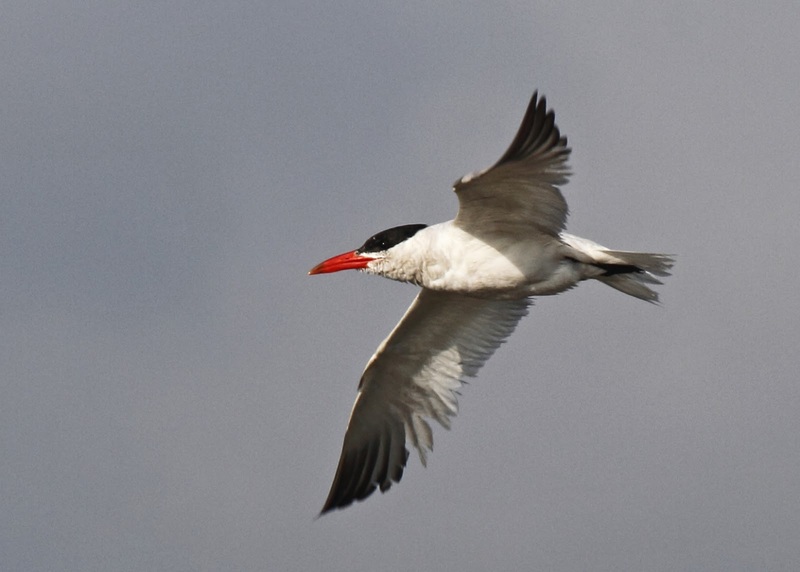 Another good bird for the day was this Caspian Tern who really put on a show fishing in the channel next to the road. This is the best photo that I have of one of these birds. 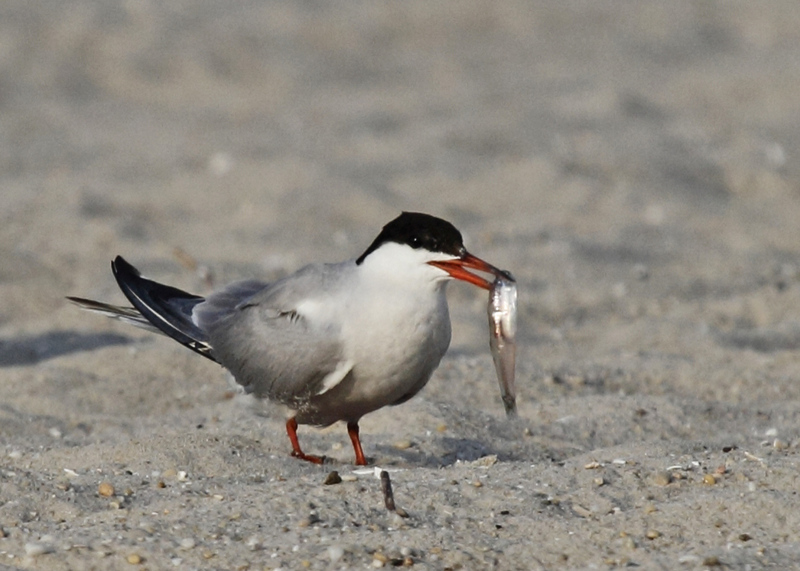 They are giant compared to all other terns and have that terrific red/orange bill that you can see from a mile away. I ended the day on the beach at Cape May sorting through the hundreds of Common Terns hoping for a rare Sandwich Tern. No luck on the Sandwich Tern but Connie and I got to observe the Common Terns up close. This guy brought a fish back for one of his babies. Harvey might be the expert at Forsythe, but you-know-who has a few tricks up her sleeve too ya' know. I suggested that we check out the dike at Higbee for shorebirds. This is definitely out of the ordinary, so he looked at me like I was crazier than normal. The dike is really just a big pile of mud that is about 2 stories high next to the Cape May canal. This is where they dump the goo that they dredge out of the bottom to keep the canal deep enough for the ferries. 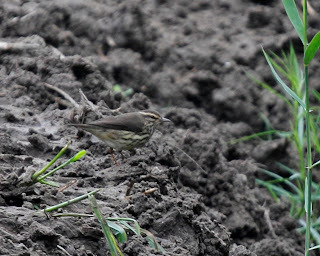 Birders climb to the top of the dike to see birds like warblers and sparrows flying by during migration, not shorebirds. Ah, but what I noticed earlier in the summer was big cranes and bulldozers up there. That means that the dredge was on! That means oohey, gooey, mud. 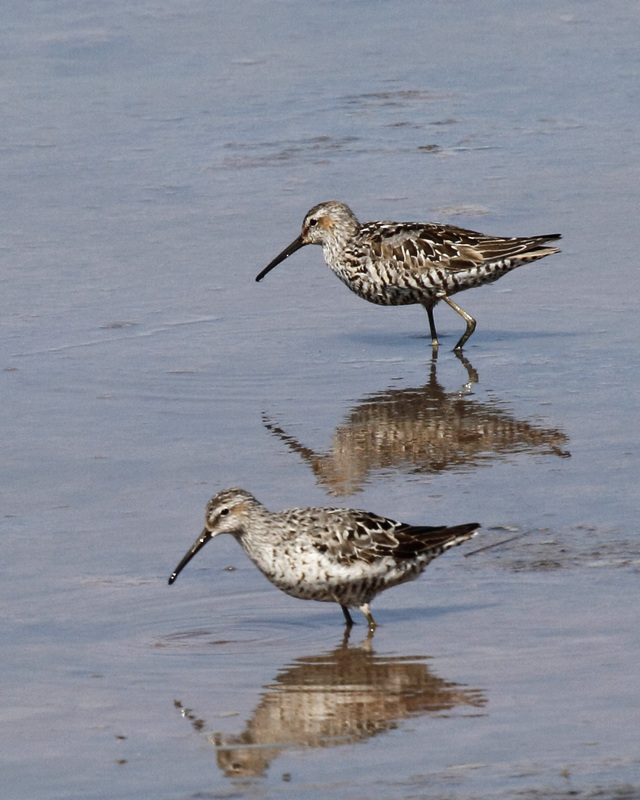 And that, my friends means shorebirds! Here are some of the birds that took advantage of the muddy mess at the dike - including Northern Watherthrush which is a warbler but likes goo anyway. Needless to say, I got kudos for dragging Harvey and George up the muddy hill. We will definitely make this a regular stop this "Fall". Gee, Linda...I tried and tried to find the "Stupid Contest" website, but it always comes up ERROR. Could I possibly be looking for something that does not exist? H'mmm? 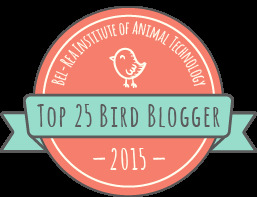 Hi HH - I think your bird is a juvenile Cardinal. The stupid contest is wearing me out.